The history of surveying and measurement has been part of FIG work since its establishment more than 130 years ago. This is natural because of the role of surveying, mapping and exploring the globe since beginning of mankind. The history was originally part of the general professional commissions (Commission 1) and then received its own place in the FIG structure, first as an ad hoc Commission and then as a permanent institution of the Federation. 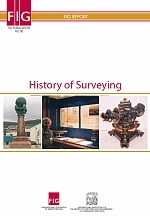 Since its establishment the International Institution for the History of Surveying and Measurement (IIHSM) has been very active in organising its events, exhibitions and reprinting old books that are relevant in understanding the history of geodesy and surveying. The biggest result of the IIHSM has been the work on getting the Struve Arc included in the list of the UNESCO World Heritage Monuments. Together with authorities from the ten countries where the arc exists the long time dream was finally recognised in 2005. This publication recognises also this work together with other activities that the institution has managed to implement during its more than fifteen years of history. 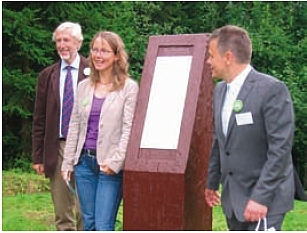 I would like to express the sincere thanks of FIG to Jan de Graeve, Director of the Institution, Jim Smith, Honorary Secretary of IIHSM and other members of the institution for all their efforts in making the history of surveying a part of our common heritage within FIG. Surveying has been a focal point of evolution in technology joining mathematical applications to innovations in mechanical engineering and instrument construction technology. The original aims of a couple of surveyors has been realised through the International Institution for the History of Surveying and Measurement (IIHSM) – Permanent Institution within FIG. Over the last 15 years we have realised several objectives to the benefit of much goodwill from many colleagues and mutual understanding over the language barriers. The interest over the borders for the history of our profession has created many local working parties and it has been our goal to prepare some links between these local groups. Since the early 1990s we have assisted, with local surveyors in ten countries, in the realisation of inscription of the Struve Geodetic Arc on the World Heritage List of UNESCO and thereby making our profession benefiting from worldwide recognition. The aim to link the Struve Geodetic Arc with the Arc of the 30th Meridian through Eastern Africa could help to understanding, and some day predicting, the tectonic movements and the changes in the figure of our earth, by controlling the protected points for the foreseeable future and to understand the 3-dimensional deformations. The study of early surveying books can also be profitable for the future. 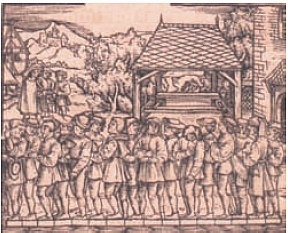 The Romans used different borderstones and they were linked by directions and distances in a codescript; see for example The Ascanius manuscripts in Wolfenbüttel of the late 5th and 6th centuries published by Galland in 1554. Have you an instrument that visualises your survey on the land? It was described by Master Martin in the Surveyors’ Perambulator in 1661 and a similar instrument exists in the Deutsches Museum in Munich, and the most sophisticated is at Leiden in the Boerhaeve Museum that was used for finalising the drawing. With satisfaction we see that the attendances at the history workshops are steady around 50 with a new focus and interest from African colleagues as well as visiting non-surveyors. We can learn from our past and today’s new technologies will be collectables in the near future. The professional work in FIG is done by Commissions, at present 10 in total and each covering a particular area of the professional interests. The other sub-division is that of Permanent Institutions. The International Institution for the History of Surveying and Measurement (IIHSM) is one of the two Permanent Institutions within the FIG. A director, who shall be nominated by a member association in the country in which the permanent institution is housed. The Council will consider the nominations for the director and submit it to a vote of the General Assembly. The appointment of the director is for unlimited period. The other officers are appointed by the institution itself. The FIG Council will ensure that the work of a Permanent Institution accords with the Federation’s plan of work. Director of the permanent institution may attend meetings of the General Assembly and may participate in debate but shall not have voting rights; and shall present a report on the work of their permanent institution to each meeting of the General Assembly. Each permanent institution shall be responsible for its own finances and for any expenses incurred by its director. Hence the work is sustained either from institutional support or from any income generating activities. A recently re-discovered Repsold theodolite used on the Struve Arc. 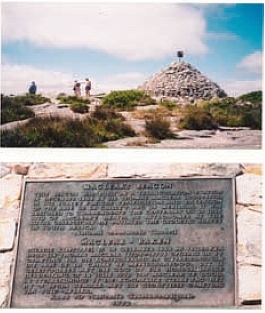 Maclear’s monument on Table Mountain, Cape Town. The study within FIG of the history of surveying was started within FIG Commission 1 from the Sofia Congress of 1983 and continued there until 1994 when it was made an ad hoc Commission 0, later it was for a while referred to as ad hoc Commission 11 and then in 1998 it became a Permanent Institution within FIG and remains so to today. It gathers together small groups of persons interested in any aspect of the history of surveying and measurement for workshops or symposia, generally coinciding with events of the main FIG but not exclusively so. In addition it has mounted several exhibitions and taken on a major research project as well as other smaller ones. 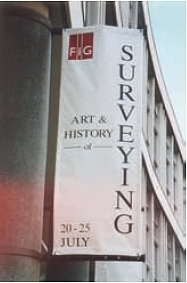 The aims of the Group for the History of Surveying were formally set out at the FIG Congress in Melbourne in 1994 although they had been the unwritten aims of the Group for some years before. To study: Surveyors and their work; practical geometry; and surveying instruments and their evolution. To preserve: When possible preserve surveying instruments of historic value; basic documents for identification of property; and documentation e.g. books, manuscripts, personal notes. To inform: The Council of its work; colleagues during FIG meetings; the general public by publications, reports, reprints; and the authorities by recommendations. 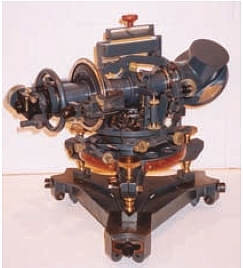 The 36 inch theodolite used on the Indian triangulation. 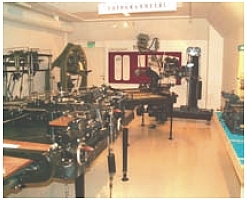 Part of the survey museum of the Norwegian Survey Dept. Honefoss. The achievements not only of surveyors and colleagues of great repute in history, for instance Mercator, Euclides, La Condamine, William Roy, Everest and Struve but the more recent colleagues and instrument constructors. The publication Feinmechanik aus Kassel – 225 Jahre Breithaupt & Sohn is a good example of the record of development within a major surveying instrument firm. Practical geometry, other than the very recent, with the application of integrated numerical systems, the evolution of knowledge and of the methodology of measuring practice has been a slow evolution based on applied geometry, trigonometry and descriptive geometry in function of the available instrumentation. The evolution of surveying instruments. Today there are only a few works on the subject. Even the theodolite, which has been THE instrument, has been studied without a final work especially of the forerunners of the instrument described by Digges as the instrumentum topographical, but also his instrument called the theodolite was what is called a plane circle, a “platkloot” in Dutch, a “cercle entier” in French or a “full Kreiss” in German and not a theodolite. There is scope for much more to be written authoritatively and in depth. Early in its existence with its European colleagues the Group prepared for Europe an international trilingual directory of places of interest for the Surveyor: Helmut Minow. Historical Surveying Instruments – List of collections in Europe – 1st (1982) and 2nd edition (1990). This publication details the holdings of many of the more important repositories of old surveying instruments. As a result of this initiative two of the larger museums have produced remarkable catalogues and inventories. IIn Dortmund (Germany) the German colleagues completed in 2010 the 3rd edition of Museumhandbuch. 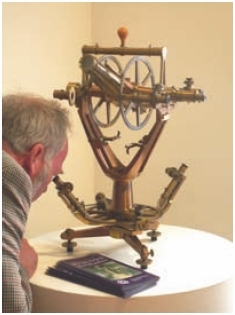 Vermessungsgeschicte and in Cambridge (U.K.) the Whipple Museum produced The Compleat Surveyor by Jim Bennett and Olivia Brown and their first catalogue of a series: no. 1: Surveying. There is an urgent need to work for preservation, promotion and collaboration. So often today one hears, too late, that this or that establishment has jettisoned its store of old, early or obsolete surveying instruments. 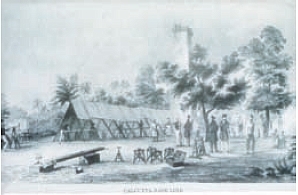 LaCaille’s Arc measure in S Africa, 1752. The instruments of historic value. In Strasburg for example, a Technical School – threw away a complete collection of original photogrammetric instruments from the early 19th century, just because a new teacher wanted space for new equipment. Despite our efforts the whole heritage was lost! This was one of the many frustrations suffered from time to time. There have been some success stories, for example in the preservation of a 16th century Arsenius Astrolabe in Paris (I.G.N.). The first astrolabe, signed G(erard) M(ercator) of R(upelmonde) was brought to the attention of Prof. Gerald L’E. Turner from Oxford who attributed two more astrolabes to Gerard Mercator and the preservation of a set of instruments of CHAROT (Paris) in the Antwerp Van Heurck collection. Through the careful study of instruments and of the related methodology from historic textbooks in specialised libraries, one can link and research the control of the results of early measurements. In addition the degree of precision of measurements and the accuracy, resulting from cartography can be studied but so far very little work has been done on this topic. To preserve basic documentation for identification of property. There is a role in the public interest to secure the borders of property. This is the basic reason of the function of the “land surveyor” from Egyptian times until today. In Eastern and Central European countries a period of non respect of property rights has caused great political, financial and economic trouble due to lack of this fundamental right of property respect. Klaus Rürup and Georg Milev presented a paper giving in detail some of the consequences and results. The change of technology and the quick obsolescence of technology will make it more and more important to keep the original records and secure them for the future. Since Guttenberg invented the printing process in the West, knowledge has been secured through books for future readers: verba volant scripta manent. In addition manuscripts and personal notes of surveyors are of utmost importance, the field books, the notebooks and diaries of party walls, are a fundamental heritage of the surveyor, as in some countries the official documents become unavailable due to failures in the administrative systems. Tartu Observatory: point O for the Struve Meridian. 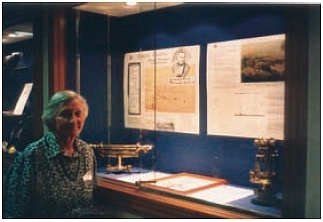 IIHSM gave help to Berres Colville during her writing of Robert Hoddle-Pioneer Surveyor 1794–1881. Introducing the history of surveying should be part of the education system, although the evolution of instrumentation has often been part of that already. Achievements in, and the evolution of, techniques and instrumentation can prepare any new generation to work with completely new technologies as today where a given technology might be obsolete within 20 or 30 years. Can readers remember that the first Hewlett Packard 65, compact computer with programmes, was launched only in 1972 and prior to that it was necessary to use logarithmic tables, nomograms and hand cranked calculators? There was no (affordable) electro-magnetic distance measuring equipment available for every survey party, until the Geodimeter and the Tellurometer were invented within ten years of each other shortly after the War II and changed the methodology of surveying from triangulation to trilateration. Surveyors can act as experts together with other institutions such as educational institutions, public authorities and museums and together with curators take care of surveying collections. Even now efforts are being made to gather sufficient interest and funding to found a Museum of Map Making in the U.K. This idea has been around for many years but there is gathering impetus now with the increasing loss of appropriate artefacts and the loss of the dedicated land survey display at the Science Museum in London. Many National Survey Organisations feel it to be their duty to set up museums of their past achievements and instrumentation, but some as the Ordnance Survey in the UK have yet to be sparked into life in this area. In addition there can be cooperation with study‑groups in other disciplines, working in similar fields such as the history of geodesy, cartography, hydrography, geology, photogrammetry, astronomy, mathematics, the history of scientific instrument societies and history of other relevant sciences. Some already exist, for example, in the Netherlands. As in earlier times the “Géomètre” or the surveyor was the learned man practising all or many of these fields. Informing the FIG Council and the Congresses and Working Weeks on the progress of the work of the Institution. This was discussed in a General Assembly where the three possible means by which that end could be most affectively achieved were debated. The possibilities were: a specific commission; a task force; or a permanent institution. The outcome was the formation of the present Permanent Institution. The title might imply a body with numerous paid members of staff. However, the permanent institutions work on a voluntary basis in the same way as the FIG Commissions. Dissemination of information to the general public by specific publications and where the role of surveyors and surveying are preponderant. 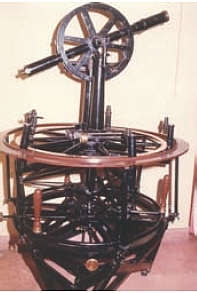 An example at the time of the Melbourne Congress was: The Divide Circle – A history of Instruments for Astronomy, Navigation and Surveying, by Jim Bennett. Lastly surveyors have a role in society and so often have key positions in administrations, technical services, or government duties where our influence by recommendation, to public authorities, will be of primary importance and especially to give guidelines for preservation of basic documents for identification of property and for safeguarding the instruments. It was noted that groups studying the history of surveying already existed in many countries for example, Germany, Belgium, France, Switzerland, United Kingdom, the Netherlands, Australia, USA, Poland and Hungary, and interest for the subject was acknowledged by the FIG Council. History Workshops and/ or exhibitions have been held at most of the FIG Congresses and Working Weeks since 1985. For the assistance of future researchers a list of the papers presented at the above gatherings is on the website of the IIHSM. Additionally the Group has supported various other appropriate gatherings around the world. At the FIG Melbourne Congress of 1994 delegates from Finland floated idea of trying to obtain UNESCO World Heritage status for the Struve Geodetic Arc. This is a triangulation scheme observed between 1816 and 1852 from the North of Norway to the Black Sea. This turned into a major research exercise that was to cover ten years of effort before it finally succeeded, see also chapter 3.1. Martin Hotine. In store at the Science Museum, London. Struve submission document to UNESCO, 2004. Surveyor General of Norway, Jan de Graeve, Bjorn Geirr Harsson, The Minister of Fisheries, Jim Smith and the Mayor of Hammerfest. The field work on the Struve Geodetic Arc (or Russo–Scandinavian Triangulation) was observed between 1816 and 1852. Before the end of that century there had been several expeditions to try and trace the surviving stations. Aarne Veriö  refers to this in his paper of 1993 where it is noted that Professor Alfred Petrelius of the Technical University in Helsinki made systematic searches in 1886, 1888 and 1889. At that time local knowledge of the measurement scheme still survived and he was able to draw upon some of that in his searches. His activities were in the area from the South coast of Finland to the northernmost point of the Gulf of Bothnia near the city of Kemi. Of the 71 stations in this section, 8 were not marked permanently and of the other 63 he found 51. In 1914 efforts were made by K. H. Mannermaa to find stations north of Tornio; in 1928 by Aarne Rainesalo and later expeditions took place in 1968 and 1989 on the initiative of Seppo Härmälä who had been a Deputy Director General of the National Board of Survey for Finland. These latter investigations were by Aarne Veriö who found that of the 92 points on Finnish territory 8 were undocumented (presumably the same ones as Petruvius had noted), and of the remaining 84, 61 were found, 18 were known to have been destroyed and 5 were of unknown fate. All this background was brought together by Aarne Veriö in a paper produced in 1993 for an International Scientific Conference in Tartu (formerly Dorpat), in Estonia to mark the 200th anniversary of the birth of F. G. W. Struve and J. H. Mädler and the 100th anniversary of E. J. Öpik. This Conference took place from 26 to 29 August 1993. Although he did not specifically suggest in the paper the idea of the Arc becoming a World Heritage Monument there was nevertheless a Resolution accepted on 28 August 1993 “urging the governments of those countries i.e. Norway, Sweden, Finland, Estonia, Latvia, Lithuania, Ukraine, Byelorussia and Moldavia that still possess relics of that enterprise to take all possible steps to preserve those relics”, including an approach to UNESCO to declare them to be World Heritage sites (Russia was inadvertently omitted in the drafting of this Resolution). The Chairman of the meeting was Alan H. Batten, an astronomer from Canada, but English by birth, who had, only a few years earlier, published a book on the lives of some of the Struve family. . That volume contains a chapter on Measuring the Earth. The following year FIG held its Congress in Melbourne, Australia (5–12 March 1994). There Bjorn-Geirr Harsson presented a paper  summarising the work of Struve and the various phases in which it was carried out. Like the Veriö paper, this did not contain any direct suggestion that the Struve Arc might be submitted for inclusion on the UNESCO World Heritage List. However immediately after the session in which Harsson gave his paper, Seppo Härmälä suggested to Jan de Graeve, Chairperson of FIG Commission 1 that it might well be appropriate to ask FIG to consider a resolution on this topic. 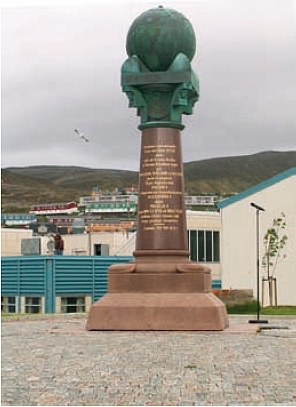 Struve monument at North end of the arc – Hammerfest. Latvia. Struve point Sestu kalns: Bjorn Geirr Harsson, Nienke Bientema, and Janis Kaminskis. 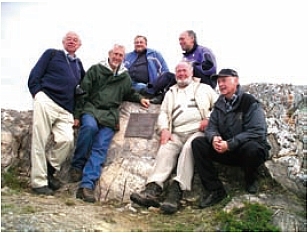 The Alta Struve point in Northern Norway: Jim Smith, Bjorn Geirr Harsson and Jan de Graeve with three local residents. that FIG should present a request to the United Nations that the remains of this arc of the meridian be added to the World Heritage List of historical monuments. * Note that as in the previous Resolution, Russia was again inadvertently omitted. A further similar resolution was passed at the General Assembly of the International Astronomical Union (IAU) at its General Assembly in The Hague in 1994. In addition the International Association for Geodesy (IAG) also expressed its support. Plaque of Struve point Puolakka in Finland. At that time, 1994, historical topics within FIG came under Commission 1 but the IIHSM was soon to come into being. Those in Commission 1 with historical interests took the idea up and began the prolonged efforts to get all ten countries interested and actively working together on the project. Language problems were only some of the many difficulties encountered in what was very much a multi-cultural exercise. “There is still one more aspect to be discussed. As mentioned before, the 2 tomes by Struve where the Arc was documented, belongs to the history of surveying. It is valuable and it is interesting. Unfortunately the book is now a rarity, seldom found in libraries. It is uncertain whether it is found in every involved ten countries. It is true that it has been reprinted in Russian in Moscow. No doubt that must also be out of print. 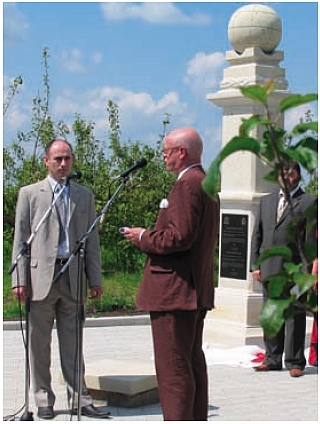 The Prime Minister of Moldova with Jarmo Ratia Director General of National Land Survey (Finland) in The Ukraine at the Monument at Rudy in Moldova. 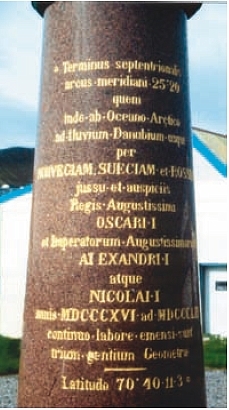 Monument inscription at the South end of the Struve arc in The Ukraine. Härmälä was hoping that a submission could be made by the end of that year, 2000, but that was over-optimistic by 4 years. 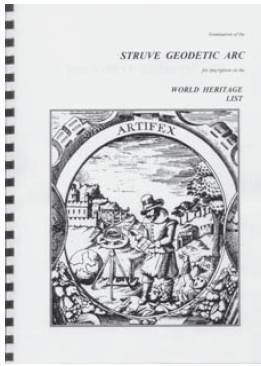 One major problem was the fact of how different the Struve Geodetic Arc was to any other WHM up to that time. The Pyramids, The Victoria Falls, Stone Town in Zanzibar and the Taj Mahal for example were all features of great size, great attraction and visible from miles away. The Struve arc to be presented to UNESCO in 2004 was 34 points, each of a small mark in a block of stone at most about 0.5 m across, spread over 2821 kms and each only visible (if at all) when nearly on top of it. Even when marked by a nearby monument and inscribed plaque any one of them only occupied around a square metre. So how could such a project qualify? In discussions with UNESCO this seemed not to be a problem. In its favour was that the WHM would span 10 countries, a very appealing idea to UNESCO, whereas most other designated WHMs were in just a single country. The international cooperation over ten countries was of great appeal. In addition it was felt that UNESCO could introduce a new category of monument, one that related to a scientific achievement rather that of the culturally and visually attractive sort. In 2002 the IIHSM compiled an Interim Report of the material then available on the Struve Arc as a means of spreading the word of its worth and of attracting funding. Some of this material later formed part of the final submission. However, discussions with a UK UNESCO delegate left one with no doubt that it was a hopeless case and not worth pursuing. It is encouraging to recall how that advice was ignored to good effect. 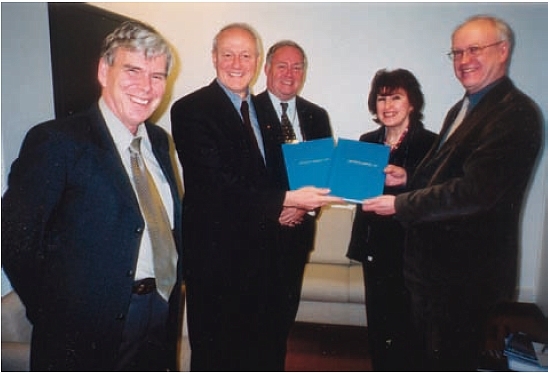 Pekka Tätilä, Jan de Graeve and Jarmo Ratia with the officials of UNESCO submitting the proposal in 2004. Since the beginning there had been a continuing, but spasmodic interchange of information with the National Land Survey of Finland but it was at the Struve Conference in Tallinn in 2002 that the National Land Survey of Finland took on the massive task of compiling and printing the final documentation to be presented to UNESCO. On several occasions meetings were held in Brussels when a representative of UNESCO met the Board of the IIHSM. He was knowledgeable in the techniques of surveying and could appreciate what was involved whereas many other UNESCO WHM delegates and staff would be from other disciplines and know little if anything of the subject. The major unknown was to be the particular interests and specialisations not only of the UNESCO inspectors but particularly of those who would be doing the voting. How many of them would have any knowledge of surveying, particularly in our case, of geodesy? There would be architects, archaeologists, specialists in heritage protection and others but the presence of a land surveyor would be unlikely. So it was that a major part of the submission was a section on the “Background of the Struve Geodetic Arc” written with the non-surveyors in mind. This set out, albeit briefly, but in simple terms, what triangulation was, what it was trying to achieve, and the problem of the shape of the earth. This forms the 34 page Appendix I of the submission. A Bibliography of 150 entries at section 7(c) of the submission forms a useful starting point for anyone wishing to pursue further research on the topic although there have been many further papers written since that list was drawn up in 2003. By the end of January 2004 the submission document  was complete and this was presented to the Director of UNESCO by Jarmo Ratia, Jan de Graeve and Pekka Tätilä. Arc of the 30th Meridian. (Courtesy of T Zakiewicz). 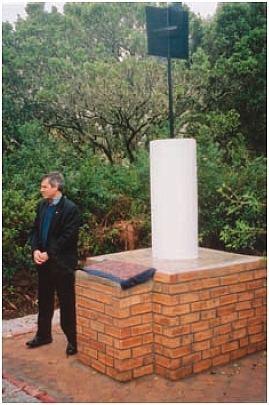 Unveiling of a plaque at the S end of the Arc of 30th Meridian at Buffelsfontein, 2004. Decisions within UNESCO have to mature and are not rapid. It would be 18 months before the outcome was known. In that time inspectors appointed by UNESCO visited all the points and had detailed discussions with many persons. Finally at its annual meeting held in Durban, South Africa, on 15 July 2005, the vote of delegates was taken and the positive decision was agreed unanimously. 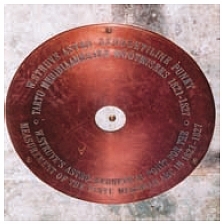 Since the Struve Geodetic Arc was inscribed on the World Heritage List of historical Monuments it has been pleasing to see how the local communities in the vicinity of any of the 34 designated points have really taken the marks under their wing and not only maintained them but promoted them. Each country held ceremonies to “inaugurate” their points, marking some with monuments and then improving access facilities, information boards, car parking and even arranging that they appear on various tourist itineraries. The most northerly point in Hammerfest, North Norway is within some few minutes walk of the ferry terminal where many cruise ships stop. It is said that in the last year alone 100,000 visitors from such ships were able to visit the monument. Of course, at the other extreme, some only attract a very small number of visitors because of their remoteness. To promote this monument in a different way a year was spent in translating from French to English the two volumes written by Struve  detailing all the work of the survey. These two volumes amount to almost 1,100 pages and are now available in a limited edition bound in simulated leather to mirror the original edition. For the future work is progressing, albeit slowly, on gathering all the relevant information of the triangulation extending to the south of the Struve Arc so that it might in due course by put forward as an extension to the same World Heritage Monument. If this happens it would provide a continuous monument from the North of Norway to near Port Elizabeth in South Africa. A span of 105º of latitude. The survey has been achieved over many years but the difficulty is obtaining all the information required and then getting all the countries involved to agree to the plan. The survey work was done between the two Great Wars for a meridian arc that connected with the Struve Arc in what was then Poland (now Lithuania) and then progressed south through Rumania, parts of the former Yugoslavia, Greece and on to Crete. 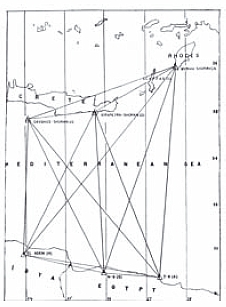 In the 1950s the American Air Force used Hiran/Shoran to effect a connection between Crete and the triangulation of North Africa. This joined three points in Crete and neighbouring islands to three points on a chain of triangulation going west from Cairo along the coast and into Libya. 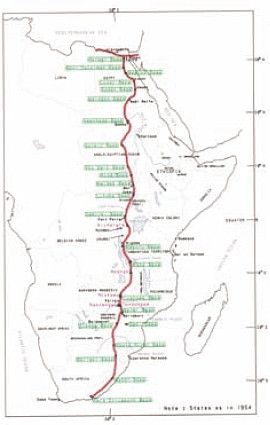 The work begun in South Africa by David Gill in the 1880s, that was to become the arc of the 30th meridian, gradually made its way northward in fits and starts until the mid 1950s when the AMS (US Army Map Service) made the final connection in The Sudan that made it a continuous chain of triangulation from Buffelsfontein near Port Elizabeth to Cairo. So although executed somewhat piecemeal a triangulation connection exists between Port Elizabeth and Hammerfest where part of it consists of much of the Struve Arc. As part of this is already designated as a World Heritage Monument it is understood that it should be easier to extend the monument than, for example, someone starting to promote a case for another arc to be recognised by UNESCO. The problem is that it is proving very difficult to obtain any cooperation at all from some of the 20 countries involved. In addition the detailed records of the work between the Two Wars is proving difficult to track down although the diagrams and coordinates still exist. Efforts are continuing to be made and who knows, in another 10 years maybe the whole 105º of triangulation may be one, world beating, World Heritage Monument. the Earth by existing or new techniques. 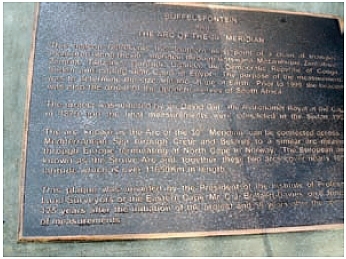 Plaque near Cairo at the North end of the arc of the 30th meridian. A continuing research project by Jim Smith is work on Captain Webb’s History of Geodesy Notes. This came to light after Jan de Graeve had visited Cape Town in 1985 and saw the mass of material available that no one was working on. It has turned into such a large and almost open ended exercise that it is continued as and when time allows between other interesting projects that have occurred in the last few years. 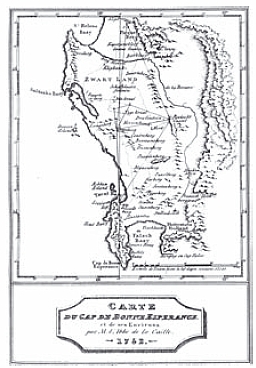 Jan de Graeve, (Belgium) has done extensive research into Gerhard Mercator, the famous surveyor/cartographer, and the contents of his library particularly in relation to the development of the Mercator Projection. A reconstitution has been done of the scientific contents of that library that were sold in 1604. The results of this research are expected to appear in Le Livre & L’Estampe during 2011. John Brock, Australia continues his research into surveyors and surveying activity in ancient Egypt. Hans-Fredrik Wennstrom, Sweden, continues his research into the Geodimeter. Thomas Glatthard, Switzerland continues his collection and analysis of texts and images about surveyors and their contribution to society in art and literature. He has contributed papers on the topic at FIG gatherings since the Melbourne Congress of 1994. In addition he has had several contributions on the topic published in international journals. One such paper is online at www.pobonline.com. He is also Editor of the Swiss professional journal Swiss Geomatics-Geoinformation and Land Management. V. Kaptüg’s extensive co-operation in the IIHSM’s project “Struve Geodetic Arc” in 2002–2004. 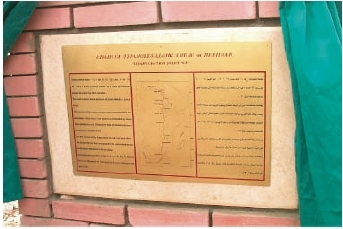 Russia and Belarus’s official participation in the “Struve Geodetic Arc” project became feasible (due to restoration of appropriate Struve stations); Lithuania has restored and included the Struve point Beresnäki which had been recommended by V. Kaptüg; those efforts contributed to the successful inscription of the SGA onto the UNESCO World Heritage List in July 2005. A nearly full catalogue of the SGA surviving manuscripts in Russia. The part of it relative to the Scandinavian Struve arc segments has been recently published on the Stockholm FIG CD of the Proceedings of its WW-2008. In Moldova the Struve point Dschamana near Chisinau previously computed by V. Kaptüg was found by the Moldovans in autumn 2006. Presently Vitali Kaptüg continues his research activities within the St-Petersburg Society for Surveying & Mapping, and participates in regular IIHSM workshops arranged in the frames of FIG congresses. Alan Wright and others, UK, continue the search for a site in the UK for a Museum of Mapping. Representatives of IIHSM have given lectures on subjects related to IIHSM for instance Jim Smith in Cape Town and Johannesburg in South Africa and Jan de Graeve in Warsaw in Poland and in Atlanta and Arlington in USA in 2009. IIHSM has responded to requests from all over the world concerning the history of surveying. Historical papers have been presented at various FIG Congresses and Working Weeks since September 1985. As an aid to future researchers a list of them is given in the appendix. An up-to-date list is also available on the web site of IIHSM at www.fig.net/hsm. The latest presentations are also available online. A commemorative exhibition has been travelling with great success to Canada in Toronto and Quebec, to England where it was on display for two months in the Science Museum, to Madrid in the Museo Naval, to Belgium in Liège and Gent. The Chernobyl disaster made it not possible to exhibit it in “Lapland”. 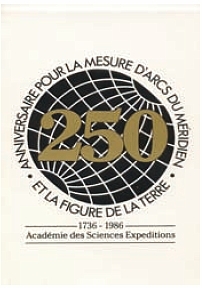 This was an exhibition mounted jointly by the Académie des Sciences of Paris and the FIG History Group to commemorate the 250th anniversary of the expeditions sent to Peru and Lapland in 1736 to determine the figure of the earth. This was a shape that had been put into doubt by the controversy between the Cassinis in France and Newton in England. Was the earth prolate or oblate? The latter proved to be the case. FIG Toronto 1986 Exhibition booklet. Over a period of 5 days an exhibition “The Art & History of Surveying” was staged at the University of Brighton Gallery. Over 150 illustrations from 33 different sources were displayed on 42 panels. The whole exhibit was later put on to a CD that was sold to raise funds for the group. It was also displayed at several survey gatherings around the world. During the period of this Congress an exhibition of historically significant surveying texts was mounted in the library of the Deutsches Museum. A CD was produced that gave details of each of the books together with some illustrations. This CD was offered to all the delegates. It was also arranged for delegates to the History sessions to see both the fine survey exhibit at the Museum and also that within the Bavarian State Survey Dept. A two day symposium and exhibition will be mounted at the time of the FIG Congress in Sydney, Australia in April 2010. Jan de Graeve visited Rome in February 2010 to prepare the IIHSM symposium for FIG Working Week 2012. Mercator will also be commemorated 15 December 2012 in Belgium, Germany and the Netherlands. Three attempts have been made to produce and sell calendars with illustrations of historical themes but these were of limited success in obtaining funds for the running of the group so have been discontinued. However the income from the calendars together with that from the reproduction books (see below) allowed sponsorship with the Moldovan partners to research the Struve points in that country and to sponsor exhibition in the Oxford History of Science Museum (United Kingdom). Two surveying texts of considerable note were reproduced in the USA for purchase. Geodaesia: or the Art of Surveying and Measuring of Land, made easy. John Love, 1688. This was the first book on surveying in the Americas. The Compleat Surveyor, containing the whole Art of Surveying of Land. William Leybourn, 1657. There are still a few copies of these available for purchase. As mentioned already, the two volumes of Struve’s Report  on his work have been translated from French to English. Any one interested in these should contact Jan de Graeve. From Plane to Spheroid. Smith J R, 1986. Landmark Enterprises. Rancho Cordova, California. Mesurer la Terre. 300 Ans de Geodesie Française. Levallois J J, 1988. Presses Ponts et Chaussées and AFT. Paris. L’Astrolabe. Les astrolabes du Musée Paul Dupuy. R D’Hollander, 1993. Le Musée Paul Dupuy et L’Association Française de Topographie. 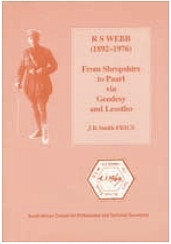 R S Webb (1892–1976) From Shropshire to Paarl via Geodesy and Lesotho. Smith J R, 1995. S African Council for Professional & Technical Surveyors, Johannesburg. History of the Geodimeter. Smith J R 3rd Edition, 1997. Spectra Precision, Danderyd, Sweden. Everest. The Man and the Mountain. Smith J R, 1999. Whittles Publishing, Scotland. 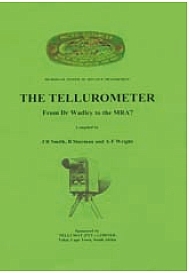 The Tellurometer. From Dr Wadley to the MRA 7. Smith J R, Sturman B and Wright A F, 2009. Tellumat (PTY.) Cape Town, South Africa. The Art of Surveying, 2006. A CD by Jan de Graeve containing 100+ illustrations from old texts relating to surveying and related topics. The source material is in the Deutsches Museum Library in Munich. 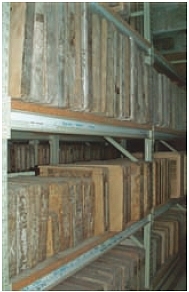 The contents of Gerard Mercator’s Library. By Jan de Graeve. Le Livre & L’Estampe 2011? 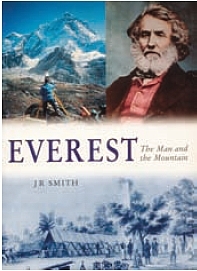 Everest – The Man and the Mountain. Attendance at the various sessions organised by the IIHSM is open to any interested persons. They need not be attending any FIG event to which the sessions are attached. Any person who has ideas for research into an aspect of the history of surveying or measurement is welcome to get in touch and make their ideas known. Whilst financial assistance is not very likely, help is often possible in giving leads to both knowledgeable individuals and printed material. Whenever it is brought to notice that important materials – whether books or instruments – are in danger of destruction then, where possible, efforts are made to secure their safety and this will continue. 1. Veriö, A. 1994. The later phases and utilizing of the northern part of the Struvean chain. Geodeet. Nr. 6 (30). pp. 27–30. Presented to an International Scientific Conference in Tartu, August 1993. 3. 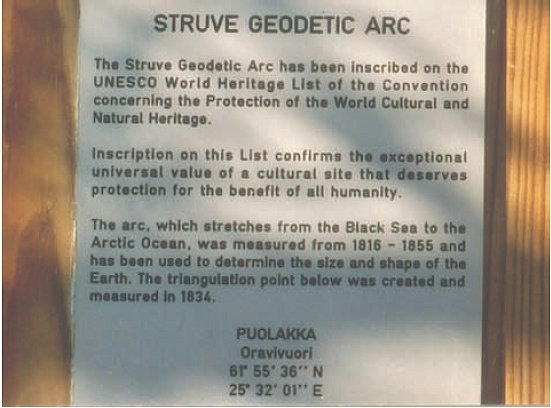 Nomination of the Struve Geodetic Arc for inscription on the World Heritage List. 2004. January. 5. Härmälä, S. Struve Arc. 2000. FIG Working Week. Prague. May. 6. Harsson, B-G (with Chubey, M S, Kaptug, V A, Preiss G and Umarbaeva N D). 1994. The Russian Scandinavian meridian arc measurements 1816–1852. FIG. Melbourne. Historical papers presented at FIG Congresses and Working Weeks since September 1985. 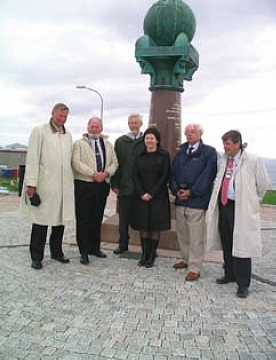 Left: Monument in Hammerfest at the North end of the Struve Arc. Middle: Ms. Berres Colville exhibiting at the FIG Congress in Brighton in 1998. 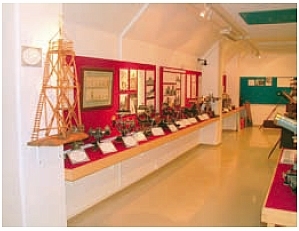 Right: 8 inch reflecting theodolite circa 1930 in store at the Science Museum, London.